Fruit Acar is a popular side dish in Malay weddings, and lends this dish a nice contrast of flavours. Place tossed Basmathi rice in chaffing dish. Melt Planta Chef Margarine in a pot, saute Bay Leaf, cumin and seed seeds till fragrant. Sweat shallot, garlic and ginger until fragrant. Transfer and mix with Basmathi rice. Add in filtered water, Knorr Chicken Stock. Covered and steam at 100° Celsius, for 45 minutes. Once cooked, gently coat prepared rice with Lady's Choice Real Mayonnaise. Set aside. Mix all the ingredients , lay the meat at the aluminium foil and flatten it evenly. Place cooked "Basmati Rice", onto flattened minced lamb meat and press it evenly. Flip over on the aluminium foil and roll, until both lenghts meet. Gently press to form the roll. Bake in pre heated oven at 160° Celsius, for 20 minutes. Discard from aluminium foil,portion to serve. Heat pan with Planta Chef Margarine. Turn down the heat, add bay leaf, cumin and fennel seed. Add dried mix fruit. Add filtered water and continue to stir -fry for another 2 minutes. Season to taste with Knorr Chicken Stock. 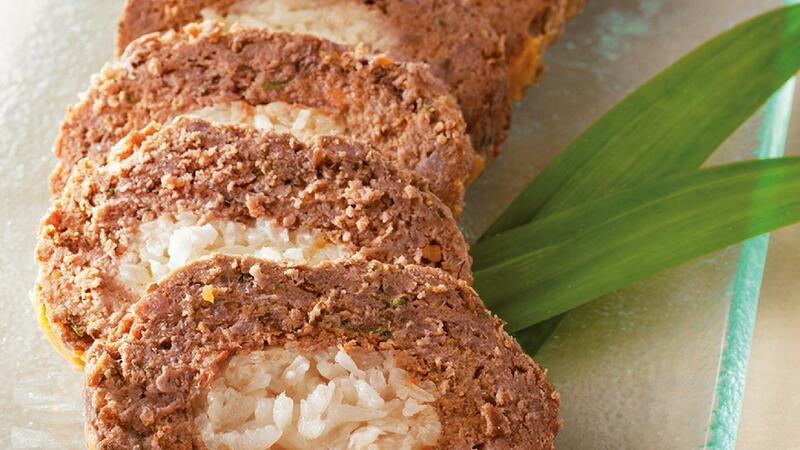 Arranged prepared "Roulade Kofta Rice". Served with prepared "Aromatic Fruit Acar".